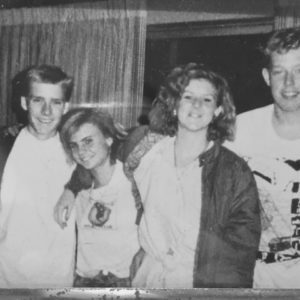 Because of the dude on the left of this photo… every year on November 22 I listen to the song Somebody by Depeche Mode, over and over. I put the song on repeat and I spend time reflecting on the life and the death of my high school boyfriend, Gary. I have been doing this for 29 years. To be honest, I think more about his death than his life because his death had a huge impact on my life. He died from suicide when I was 17 years old. Just a reminder to you all that you can‘t take anyone for granted (even those who voted for the other candidate) because there is no guarantee they will be here tomorrow. A lesson I learned at a very young age thanks to Gary. The reason I listen to the song Somebody is because Gary wrote the lyrics in a note to me before he took his own life. The lyrics are about someone wanting somebody to connect with. It seems it is about a young man feeling lonely and isolated. Gary wrote those lyrics in a note telling me that is what he wanted from me. It was a cry for help, he was feeling socially isolated. Listening to this song over and over again for the 29th year makes me feel grateful for my job at Beyond Differences. Our mission is to end social isolation. *updated on 7/30/18 to say as of today over 5000 schools across the US have participated in one or more of our Positive Prevention Initiatives! If you are so inclined please consider making a donation. As stated above, we are a tiny staff with a giant goal and we need more financial support. Thank you. I’m going back to listening to Somebody a few more times.